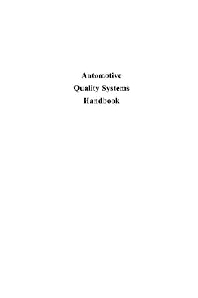 The Automotive Quality Systems Handbook is a step-by-step guide to interpreting and implementing the ISO/TS 16949. Accepted by major vehicle manufacturers as an alternative to the existing US, German, French and Italian automotive quality system requirements, this Technical Specification defines specific requirements for the application of ISO 9001: 1994 throughout the automotive supply chain. While initially the standard will be voluntary, for the first time, second and third tier suppliers may be faced with pressure to undergo third party registration. After the year 2000, the next version of the standard has actually replaced the four existing standards, (AVSQ, EAQF, QS-9000 and VDA 6 1) and the price of entry to the global automotive market is conformance to this new standard. This handbook is an essential and comprehensive guide to enable organizations to interpret and implement the ISO/TS 16949. Unlike other books on the subject, each element, clause and requirement is analyzed in detail with guidance provided for its implementation. The handbook is written primarily for implementers and discerning managers, for instructors and auditors and contains a range of solutions that would be acceptable in the automobile industry. It includes details of the certification scheme, the differences with existing standards, check lists, questionnaires, tips for implementers, flow charts and a glossary of terms. Part 1: Preparation for Registration: Basic Concepts; What Is an automotive QMS? ; Quality System Strategies; Managing Quality System Development; The Assessment; Beyond certification; Part 2: Satisfying QMS Requirements: Management Responsibility; Quality System; Contract Review; Design Control; Document and Data Control; Purchasing; Customer-Supplied Product; Product Identification and Traceability; Process Control; Inspection and Testing; Inspection, Measuring, and Test Equipment; Inspection and Test Status; Control of Nonconforming Product; Corrective and Preventive Action; Handling, Storage, Packaging, Preservation, and Delivery; Control of Quality Records; Internal Quality Audits; Training; Servicing; Statistical Techniques; Production part approval; Continuous improvement; Manufacturing capabilities; Appendices. David Hoyle is an international management consultant with over 30 years' experience in quality management. He has held senior positions in quality management with British Aerospace and Ferranti International and worked with such companies as General Motors, the UK Civil Aviation Authority and Bell Atlantic on their quality improvement programmes. As well as delivering quality management and auditor training courses throughout the world, he has participated in various industry councils and committees, including the Institute of Quality Assurance.